Warrior (shown above left) ~ "Transmits the rough-hewn masculinity of the professional pugilist with notes of leather, cedarwood and opoponax". Additional notes include bergamot and spice. Warrioress (above right) ~ "Boadicea's emboldened identity bottled: a sumptuous and imperious conflation of rose and coriander that is by turns provocative and full-bodied". Additional notes include lemon, patchouli and tonka bean. Warrioress? Well, at least there’s a name they know won’t be duplicated by anyone else. I had the same thought…there must be a better word!!! Before I read what people posted below, I was going to say “Because Xena Warrior Princess was taken.” But it looks like that wasn’t an entirely original thought. I thought the correct term was “warrior princess” or maybe “amazon”. So much easier in French, “guerrier” for males and “guerriere” (can’t get my keyboard to do the accent grave) for females. Leather’s a good note for pugilists, you’d think. Actually sounds intriguing. The Warrioress doesn’t interest me as much with the patchouli. I suppose Warrior Princess is better, but still, it makes me laugh. LOL…I don’t think it’s a requirement. Of course it’s also entirely possible that I just misunderstood…. Anyway, the line in general was far better than I expected and very much worth trying. Some of them were really lovely and unusual, particularly Divine and Intriguing for my taste. But I do find them all very confusing as the names are very hard to remember and the bottles all look the same. To make things even more confusing, they had an oud range with names that are different from the oud ones in Harrods (which I haven’t smelled). I don’t know if they are the same ones with different names or entirely different ones (my email to the website hasn’t been answered). According to my notes they were called Elegant, Emprise, Inquisitive, Intricate, Intriguing, Passionate and Provocative. There are entirely too many fragrances, but I understand they’re selling like hot cakes so I’m sure they don’t care. Really wouldn’t mind trying it….. The women’s sounds rather nice. I’m not sure about the fragrances, but I really want the bottles! They’re pretty but happily for me I don’t adore them. The rose does sound nice (and this not coming from a big rose fan), but I feel bad for the poor overused thesaurus that went into the making of those descriptions. Obviously this is the “imperious conflation” I have been waiting for. They don’t sound bad. especially the “conflation” of rose & coriander, and the bottles actually look fairly nice, though I’m not into Celt-iana. I don’t plan to be near Selfridges anytime soon though. Are feminine suffixes still actually considered “sexist”? Oh, the poor Romance (and other) languages. If you’re looking for nonsexist language, best not to read about perfume in general. I really like the bottles. I can only imagine the problems I’d have spitting out “Warrioress” when someone asks what I’m wearing, though! If Patty Smythe can be The Warrior, why not Boadicea? Are they going to come out with new releases like every week or something? I guess they don’t read this blog so they don’t have we feel about Parfumerie Generale. These may have been out for awhile, actually…I just read about them on Selfridges site this week. 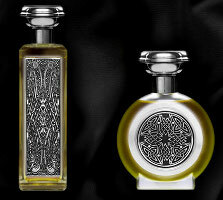 They have been out for a while, Harrods carries the full line, but now some of these are available at Luckyscent. I’m curious about this line ever since I read Mrs. Obama bought a bottle..